Classic Banana Bread is the best and I wish it would magically appear in my kitchen every day. Although, banana bread is so easy to make that it would seem like it appears by magic. It’s a classic bread that takes only a few minutes to prepare and tastes amazing every time. Try it with some butter, vanilla ice cream, or grab a slice on your way out the door. 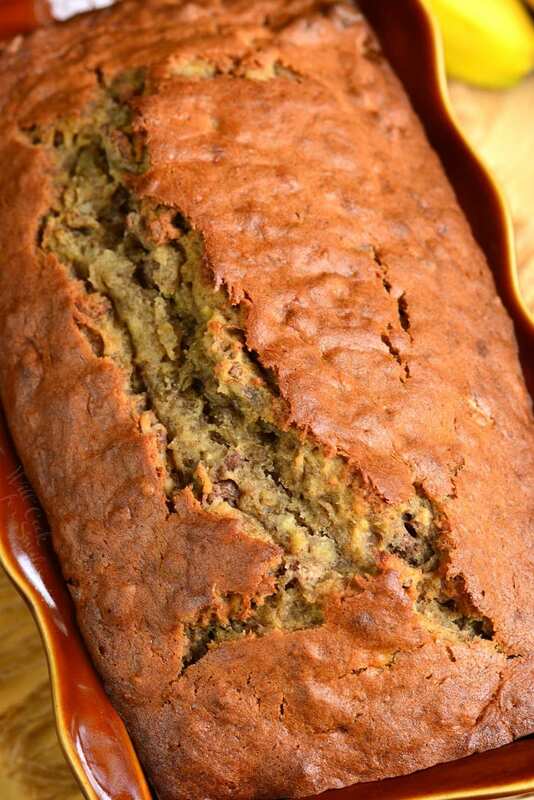 Banana bread is my far my husband’s favorite sweet bread. I think it’s a favorite for so many people because it takes us back to the childhood at first bite. Nothing beats this soft, moist, sweet bread fresh from the oven. It’s a perfect addition to the cup of coffee in the morning, a perfect after-school snack, and a perfect dessert if you add a scoop of vanilla ice cream on top. 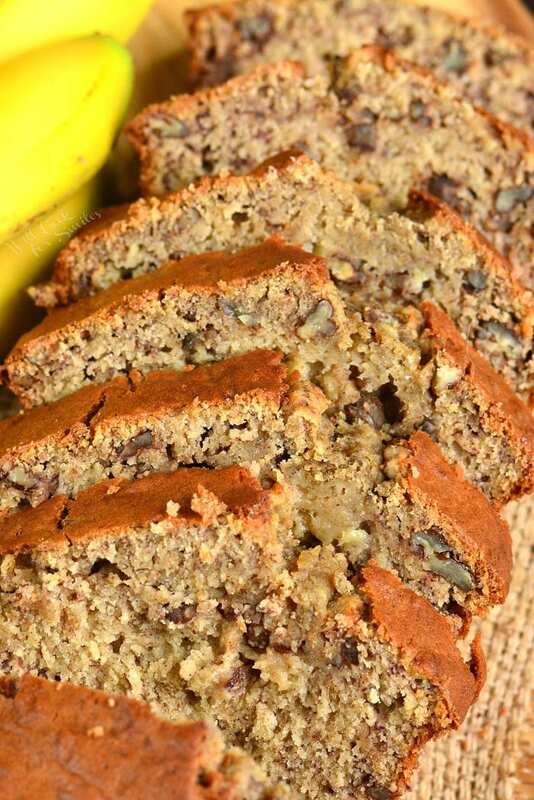 Banana bread also makes a great “grab and go” breakfast on weekday morning. If you slice the bread and wrap in slice individually, you will have an easy breakfast for the whole week. But you know what is my favorite thing about bananas? They are so EASY to make, all you need is a whisk, a fork, and a bowl. NO need to take out the mixer. Just 5 minutes of mixing the ingredients and off to the oven it goes. 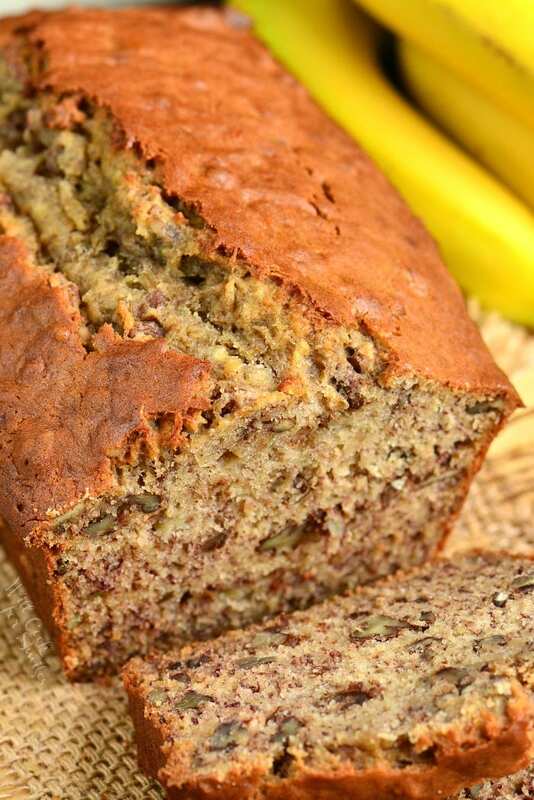 After about an hour of baking, you will be enjoying fresh, delicious banana bread. 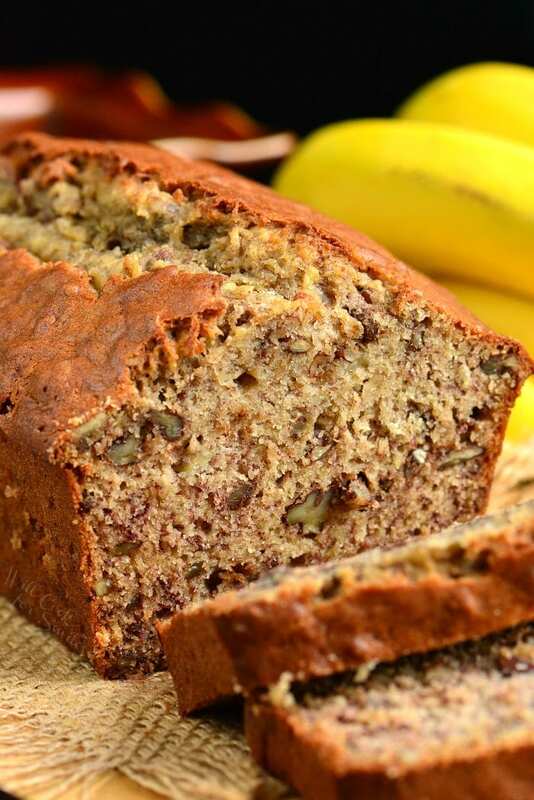 Baked banana bread can be kept at room temperature, in the refrigerator, or frozen. Bread can also be sliced or stored whole. If you know you will eat it within a couple of days, you can easily store it at room temperature for 2-3 days. Just make sure to cover it air-tight so it doesn’t dry out. In the refrigerator, it will last much longer. Make sure to cover the bread air-tight and store it for 5-7 days. Banana bread can easily be frozen whole or in slices. Bread can be sliced or frozen whole. Quick sweet breads are more moist so I like to place a slice of parchment paper in between each slice to keep them from sticking together. You can easily turn this banana bread into muffins. It’s as simple as portioning the batter into a muffin pan instead of baking it in a bread pan. This recipe will get about 10-12 muffins. I did say “about” because this is one of those bread recipes where amount is never exact. It highly depends on the size of bananas and whether nuts are added or not. You may even want to add extra nuts, which will increase amount of batter. So to make the muffins, prepare the batter the same way as the bread. Line muffin pan with liners if you wish or grease the muffin pan. Then divide the batter among the muffin cups, filling them 3/4 of the way. Bake muffins for about 30 minutes. Start checking for doneness after 25 minutes either by touch or with a toothpick. You can even prepare a quick streusel crumb topping for these muffins. 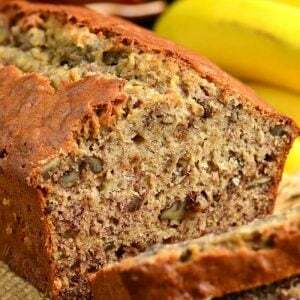 It’s a classic banana bread that takes only a few minutes to prepare and tastes amazing every time. Preheat oven to 350° and grease a bread baking dish. Mash bananas with a fork in a large mixing bowl. Leave a few little lumps. Add flour, baking soda, cinnamon, and salt and gently whisk until the batter is smooth and everything is evenly combined. Fold chopped walnuts to the batter. Do a toothpick check and if need to bake longer, bake a few more minutes if needed. Originally published on Will Cook For Smiles on March 6, 2011. I’m going to make this tomorrow and I’ll send you a pic, hope it comes out looking at good as yours! Found a link to your bread at a pumpkin and a princess (via tater tots and jello). Have some overly ripe bananas on my counter, can’t wait to try it! This smells awesome as it is baking! I have never made banana bread without additional liquid before so I’m interested in seeing how this one tastes. My Moms’ recipe had buttermilk in it. I hope it came out the way you like it!! I’ve been making this bread for the longest time so I hope it doesn’t disappoint!